On my last Trader Joe's trip, I was looking for new goodies. 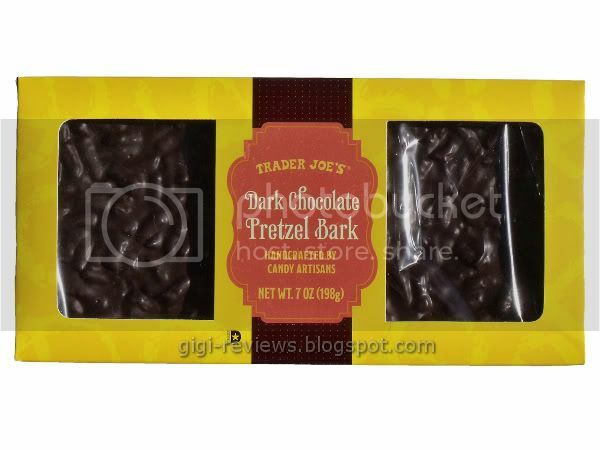 One of the things I was actually looking for were the chocolate covered, peanut butter filled pretzels that reader Jacob and had I talked about a few months ago. 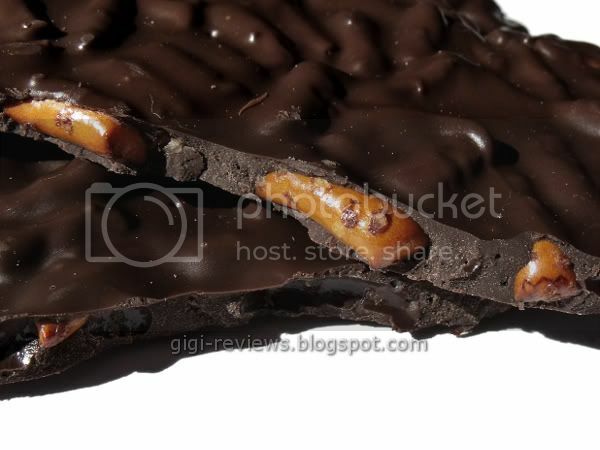 Sadly, I did not find them -- but I did come across this rather large, flat bar of dark chocolate pretzel bark. Now really, could anyone imagine that I was going to let this pass without a review? Don't be silly! The bar is well packaged in a sunny yellow box with cellophane windows. 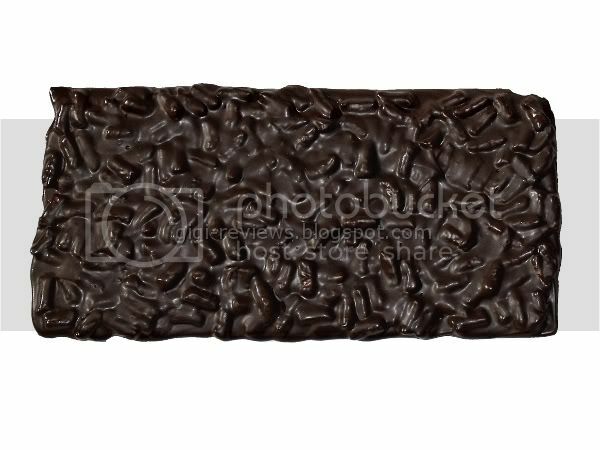 According to the text on back of the box, the bar was handcrafted by "true candy artisans." Well, I don't know who these true candy artisans are...but in my mind they wear silly hats and brightly colored clothes and make the chocolate while singing along to Michael Buble. Of course, my imagination is sort of like Tim Burton meets Crazy Cat Lady. 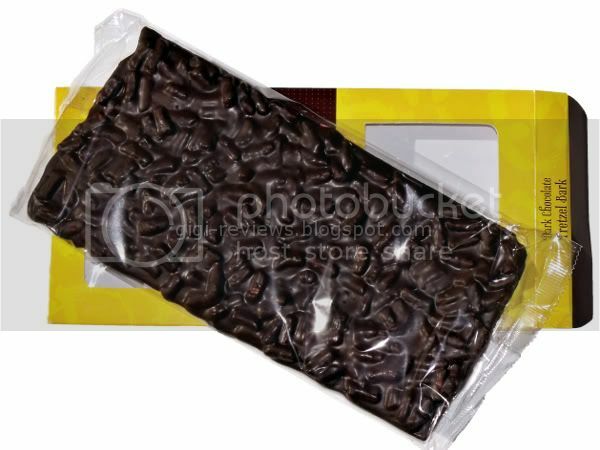 When you remove the bar from the package, you notice it's not quite as thick as the box may have led you to expect. But I don't think a good bark should be overly thick. And the slab is jam packed with pieces of broken up pretzel sticks. The chocolate looks very dark (though the box merely says that it's a minimum of 49% cocoa solids). The smell of the bar is sweet for something that looks so dark, but there is a yeasty smell to it as well. If a Michael Buble song were somehow magically edible, it's as smooth as that. The chocolate is on the milky side (and does in fact contain milk fat). It's more sweet than bitter, but that actually works to the bark's advantage. 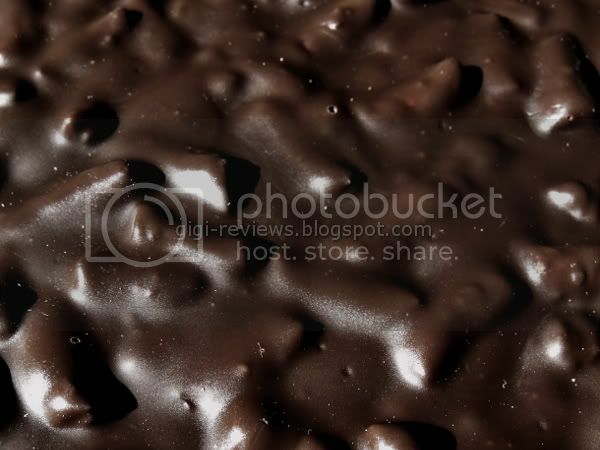 I think if it had been a stronger, darker chocolate, it wouldn't work with the salt as well. The pretzels....oh my gawd! The pretzels! They are so crunchy it's as if they came straight out of a fresh bag. They are lightly salted. It appears that they may actually be baked a little more then your average pretzel stick -- but I think that may be to keep the flavor assertive. Just get some, and then write me love letters thanking me. 200 calories per 1.5 oz (or each 2 x 4.5 inch piece). Kosher. Contains dairy. Made on equipment shared with eggs, peanuts, tree nuts and fish. That sounds really good but looks kinda...strange. Almost like chocolate-covered ants. Good to know they're tasty good! Oh. My. God. Just picked up a package on your recommendation, and I'm in heaven. As someone with a lifelong love-affair with salt, these are the best damn things in the world.